While watching the Divine Performing Arts' shows, we noticed many teachers bringing their students. Such was the case recently in Taiwan, where the Divine Performing Arts' show was a wonderful present from teachers to students. 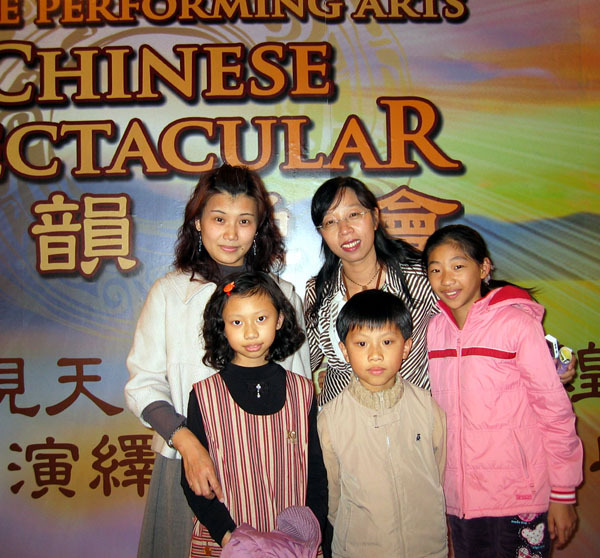 During the winter break, a teacher from Daqiao Elementary School in Tainan County went to the United States to watch the Divine Performing Arts' Show. After returning to Taiwan, the teacher told the principal and other teachers in the school about the show and recommended that they watch it. The teacher got permission from the school and invited students to register voluntarily. Watching the show was included as part of an annual programme for teachers. 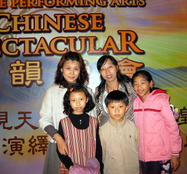 Including the principal, Mr. Chen Fengcheng, nearly 50 teachers, students and family members attended the show. Teacher Dong Qionghui brought her son and daughter. Afterwards, they happily agreed to our interview. She originally thought the ticket price was too expensive, but during the intermission, she expressed to the reporter, "It's really worth the money." Teacher Dong Qionghui felt that the ancient stories, combined with high-tech computer backdrops to express ancient Chinese culture, created a good mix between the ancient and modern. Moreover, she noted that the costumes for "Water Sleeves" were well presented. Generally speaking, people rarely use light pink and light green colours together. However, when those dancers wore these two colours, they looked so soft, gentle and beautiful. Her children especially liked the performance "Lady of the Moon" because they had learned about the legend from their textbooks. Her daughter also liked "Nymphs of the Sea!" Her daughter is studying classical ballet, while her son had no interest in dancing. After watching the show, her son changed his mindset about the suitability of boys learning dancing. Ms. Guo from Jianxing Middle School located near Kong Temple liked the Chinese dancing, as her daughter was also learning Chinese dance. When she heard good reports about the shows from Divine Performing Arts, she brought her daughter to watch it. 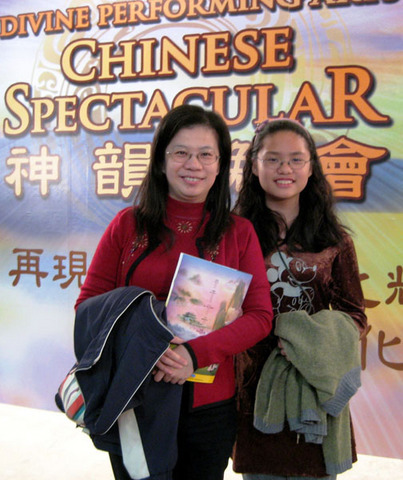 Ms. Guo said, "My daughter is learning Chinese dance, and she practices some of the movements. Watching the show confirmed what she learned in her practice. She watched the show with a lot of interest." Ms. Guo felt that everyone in the show was very good. She felt that those performers were very focused in preserving the beauty of traditional Chinese dance, and that the costumes and backdrops complemented the dancing very well. After watching the show, Ms. Guo said that she was touched, especially when seeing the show had the theme of "Truth, Compassion, and Forbearance", which is what society needs most at present. In addition, Ms. Guo was impressed by the costumes. Ms. Guo also said that Divine Performing Arts skillfully expressed the inner meaning of ancient Chinese dance.